European car registrations saw slight growth in May although volumes hit their highest level in over a decade. Data from Jato Dynamics shows that the EU car market recorded only a 0.5% increase last month compared to May 2017 but also achieved its highest volume since May 2007 while the YTD figures were the highest for this century. Jato credited the slowdown to the market stabilising following a long period of strong growth. Registrations of diesel vehicles were down by 19% compared to the same period last year, which meant diesels accounted for 36% of total registrations for the 17 European markets analysed. Despite this, the decline in diesels was not offset by volume increases in the petrol and hybrid markets. Volume for petrol vehicles grew by 15%, whilst AFVs recorded a volume increase of 27% which was boosted due to the increasing numbers of electric cars and plug-ins available in the market. Demand for SUVs remained rock solid. Volumes grew by 24.2% in May – whilst all other segments registered a decline of 8.5% – marking the 13th consecutive month of double-digit growth. The biggest driver of growth amongst the SUVs was the small SUV subsegment, which totalled 182,000 units, up 37%, due to strong performances of the segment leader, the Renault Captur, and the second-generation Dacia Duster, which recorded increases of 26% and 29% respectively. Other launches such as the Volkswagen T-Roc, Citroën C3 Aircross and Opel/Vauxhall Crossland also all recorded strong results. 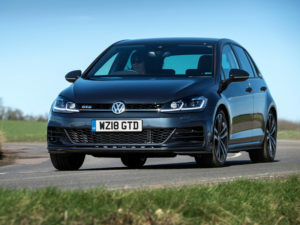 In the model league table, the Volkswagen Golf maintained its leading position, despite a decline in volume of 4%, in part due to reduced demand in Germany and France which were down 6.6% and 29% respectively. The Clio, Polo and Fiesta maintained their positions, whilst notably the Volkswagen Tiguan rose up the ranking by four places to fifth position.